Weather Station registration is now available! Some content in the weather station screens is temporary; we anticipate making adjustment over the next few months. 1. 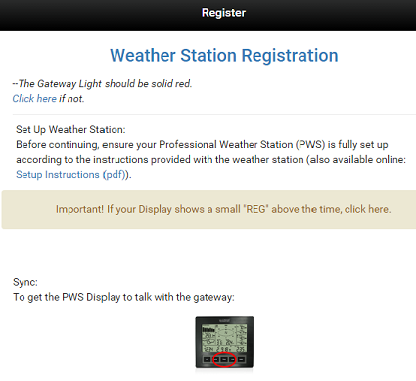 Verify your weather station is gateway-enabled (e.g. C84612/WS-2816U). (If it has a USB-stick, see below). 3. If you do not have an account on lacrossealertsmobile.com (La Crosse Alerts users see upgrade instructions), start as a New User. 4. Review the system requirements for website use (e.g. PC browser versus app). 5. If you have not registered the gateway, use the menu item Register New Gateway first (see illustration). This must precede weather station registration. 6. Select Register New Weather Station to register the display to the gateway. Instructions are complete online. USB Sticks cannot upload to La Crosse Alerts Mobile. You may continue to use your weather station with Heavy Weather Professional on your PC, wait for new models next Spring, or acquire a conversion kit. · Windows 7: Start, LaCrosse Alerts PWS, Uninstall. Follow instructions on the screen to complete. · Windows 8/8.1: Press the Windows key to access the Live Tiles menu. On Windows 8, right click in lower right for Apps menu. On Windows 8.1, select the down arrow below the tiles Apps. Scroll to LaCrosse Alerts PWS heading, and select Uninstall. - Windows 10: Start, All Apps, LaCrosse Alerts PWS, (right click) Uninstall. Follow instructions on the screen to complete.